The Lenten Appeal 2012 Jerusalem and the Middle East section has to date raised a total of $15403.68! This has provided $7701.84 of support to the Ras Morbat Clinic in Aden and $7701.84 to the EpicoCare Nurseries in Suez. How the nurseries make a difference. "My name is Soad Atta. I live in the suburb of Ain Shams in Cairo. I am 27 years old and I have one child whose name is Pavli. He was very attached to me and had difficulty interacting with others. When we had guests, he would come beside me and he would not want to talk with them. 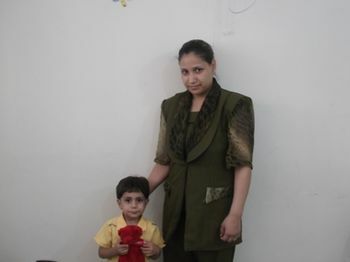 "I decided to enroll him in the nursery at the Ain Shams Development Center. In the beginning, he refused to interact with the teachers or the children there, but the teachers were very kind with him. They invited a psychological doctor to talk with him and also with me many times. After a short period he started to play with the other children in the nursery and developed good relationships with them. Now he can make his own decisions, and enjoys socializing with other children. "The nursery made a difference in my child’s life, thanks to God and for the nursery staff." $1125 NZD to the nursery at All Saint's Cathedral in Zamalek, Cairo. $1150 NZD to the nursery at El Salam Community Development Centre in Cairo. $1125 NZD to the nursery at Ain Shams Community Development Centre in Cairo. This contributed to the renovations at the nursery. This was needed as the playground was very small and inadequate, and the sewer and drainage system had to be renovated due to bad and leaking pipes, resulting in overflow and a bad smell. Mansour, the clinic administrator in Aden, “reported happily that both clinics (general and eye) are busy, the eye clinic is seeing forty patients a day, which is about capacity... A wall of tiles in the operating theatre had ‘got tired’ and slipped to the floor, but they have since been put up and steps have been taken to make sure the theatre is better ventilated.” The price of medication is soaring however, putting further strain on the finances of the Clinic.